Saving money doesn't necessarily require drastic lifestyle changes. It's possible for most people to cut back on spending and set aside some money for a rainy day by making a few small changes here and there. Generally, your grocery bill is the first place to look when you want to start saving money. Shop with a list: The most basic supermarket money-saving tip is to create and stick to a shopping list every time you go food shopping. Having a plan for your purchases reduces the waste associated with impulse buying. Plan around sales: Don't just check your pantry to fill out your shopping list. Take a look at the current week's grocery circulars so you can decide what to prepare for the next few days based on what items are on sale. Make sure that you have everything you need to prepare your favorite recipes featuring the lowest-priced items. Use coupons: Using coupons can be a great way to cut grocery costs. See How to Save Money with Coupons and this interview with the Coupon Mom for tips you can use. Avoid hungry shopping: It's a good idea to avoid shopping when you're hungry, since you'll be tempted by unnecessary treats. Eat before you go to the supermarket. You'll save money in the long run. Bulk purchasing: Buy items your family uses frequently in bulk. Whether you're shopping for peanut butter or cereal, the larger size is usually the best deal, though be careful to avoid bulk-buying items that you will end up wasting if purchased in large quantities. Chose frozen produce: Buy frozen fruits and vegetables instead of fresh. They're just as nutritious, but much cheaper. Store brands: Try store brands of your favorite products. You might be pleasantly surprised to find that they are just as good as the higher-priced brand names you've been purchasing for years. Meatless Mondays: Plan meatless meals one day per week. This can help you save money and have a positive impact on your health. While meat is good source of protein, Americans tend to consume much more meat than what is necessary for good health - 50 percent more than the recommended daily allowance according to a 2012 Huffington Post article. Portion control: Meat isn't the only thing that Americans eat too much of. According to Healthy Eating Made Easier, portions have gotten larger and larger. Excess food consumption leads to health problems, weight gain and rising grocery bills. Don't go hungry, of course, but consider if the amount of food you're consuming is really what you need. You just might find that cutting back a bit is an easy way to slash your grocery budget - and your waistline. A pretty big portion of your household expenses goes to utility bills. 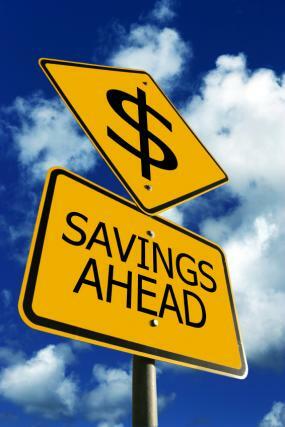 Reducing energy usage in your home can be a good, easy way to reduce your monthly expenses. Cut fuel costs: Take steps to reduce fuel expense. The more time you spend running back and forth across town, the higher your gasoline bill will be. Plan errands and activities to cut down the number of miles that you drive can help cut costs. Carpooling to and from work, school and other activities can also help. It's also important to take steps to maximize gas mileage. A few examples include keeping your tired evenly inflated, sticking with the speed limit and removing excess cargo from your vehicle. Use small appliances: Microwaves, slow-cookers and other small appliances provide a convenient and energy efficient way to prepare meals. They can be much less costly to operate than full size appliances. Plan leftovers: When you are cooking with your full-size stove and oven, prepare enough food for several meals. This will allow you to make the most of the energy expenditure and ensure that you have meals that can be reheated quickly and easily for a few days, or taken to school or work for frugal lunches or snacks. Adjust your thermostat. According to Green Home Guide, you can save about three percent on your energy bill for every one degree that you lower the thermostat setting in the winter or raise it in the summer. Change the temperature by one degree each day until you find a setting that's comfortable for you and your family. Power off: Turning off electrical items when not in use can save you money. For example, according to an article published at TIME, shutting off your computer at night can save about $70 per year. Some items continue to draw power when they are plugged in, even if they are not on. An article on ElectricityForum.com mentions satellite dishes and cell phone chargers as items that you should unplug when not in use to reduce energy usage. Upgrade to Energy Star: When you need to buy a new appliance, look for the EnergyStar logo. This designation indicates that the appliance exceeds minimum federal energy-use standards, thus reducing your monthly utility bills. As you might expect, one of the easiest ways to save money is to simply take better care of the items you already own. Following proper maintenance procedures is not difficult and can extend the life of your belongings, reducing the need for costly repairs and even more expensive replacement purchases. Vehicle maintenance: Regular oil changes may seem like a small thing, but they can add years to the life of your vehicle. Home maintenance: Use a home maintenance checklist to keep track of the various tasks that need to be performed to keep your home and appliances in top condition. Pre-treat clothes: If you seem to be constantly buying new clothes to replace stained items, buy every person in your house a set of laundry stain removal products. Show each person how to pretreat stained items before tossing dirty clothes into the hamper. Preserve containers: When you're storing spaghetti, lasagna, or other tomato-based dishes in plastic containers, spray the inside with a thin coat of vegetable oil to prevent the formation of unsightly stains. Everyone needs a bit of fun, but entertainment doesn't have to be costly to be enjoyable. With the rising price of eating out, going to the movies and other traditional entertainment activities, it's a good idea to consider less pricey ways to have fun. Supper club: Instead of meeting friends in restaurants for evenings out, start a supper club that involves taking turns having a potluck dinner gathering at each person's home. You'll enjoy the company of your friends without running up a sizeable restaurant tab. Trade child care: If you have young children, babysitting can be a major cost barrier to spending an evening out in the company of adults. Consider trading babysitting services with parents who have children close to the same age as yours as a no-cost childcare option for occasional outings. Cut TV costs: If you still have traditional cable, you may find that you can save money by switching to allow-cost streaming service like Hulu Plus. Free e-books: If you are willing to be a bit flexible with titles, read free books online or limit your e-reader downloads to freebie titles. A wide selection is available through Amazon's Kindle store, with no-cost options changing frequently. Spa night at home: Instead of spending $75 or more on a spa manicure or pedicure, invest in a portable foot spa and a few bottles of nail polish, cuticle softener and polish remover. You'll be able to pamper yourself with a DIY manicure and pedicure at a fraction of the cost of a spa visit. Outdoor activities: Look for fun family outdoor activities that everyone in your household is likely to enjoy. Doing so is a great way to spend special time together without breaking the bank. Cell phone: Shop around for a cell phone plan that truly meets your needs. Comparison-shop plans to find out what kinds of deals different providers have to offer, taking into consideration your usage habits and what you really need. Cutting costs from your regular expenses can be a good way to gain access to funds that you can use to save for the future. Start building a rainy day fund so that you'll be prepared to deal with unexpected expenses or emergencies that come up. Bank coupon savings: If you start shopping with coupons, look at your grocery receipts to see how much you saved. Make a deal with yourself to put half of the savings from each supermarket trip in a savings account, and keep the promise. Round up transactions: See if your bank offers a "round up" option that automatically rounds up each check or debit transaction to an even dollar amount, depositing the difference into your savings account. Accrue change: When you have loose change in your pocket, drop it in a container. Roll the coins and deposit them in your checking account every few months. Redirect luxury purchases: If you're in the habit on a luxury that can easily be replaced, make the change and redirect the money you save to the bank. For example, if you are in the habit of buying a $4 gourmet coffee every workday, start making coffee at home and re-direct the $20 that you refrain from spending each week to the bank. That will add up to $1,040 accrued per year, without taking interest income into consideration. Living a frugal lifestyle is not difficult. It just takes making a few changes to start getting spending under control. Once you see your bills start to come down and find yourself actually being able to put money in the bank, you'll find that the small sacrifices you have made will be well worth the benefit.